EA through it's international network which includes EA Group and it's assisting business partners provide assistance services 24/7 worldwide. 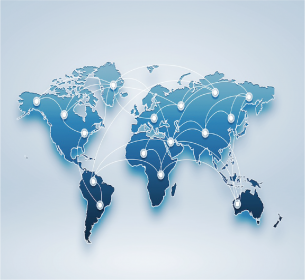 The Europ Assistance network combines global efficiency with local solutions. Europ Assistance as a group, we provide our clients with a wide range of support services and assistance spread across 5 continents, 44 associates subsidiaries, Europ Assistance the local market reflects its professionalism in accordance with the laws of the country in which it is located. 8000 employees in order to provide its customers with 24/7 high service level solutions, EA employs 4700 assistant service operators in its 35 assistance solutions centers. EA is ready to serve day and night with 725000 suppliers, Europ Assistance developes its extensive network with various suppliers to solve customer requests and provide immediate solutions to complex problems. This network is monitored and managed within the 5 main lines of Europ Assistance Group. If you would like to be a part of our professional network, please send details of your compnay to "network@europ-assistance.in"